Being an archipelago, the Philippines has a vast inventory of cultural heritage sites and practices related to water. 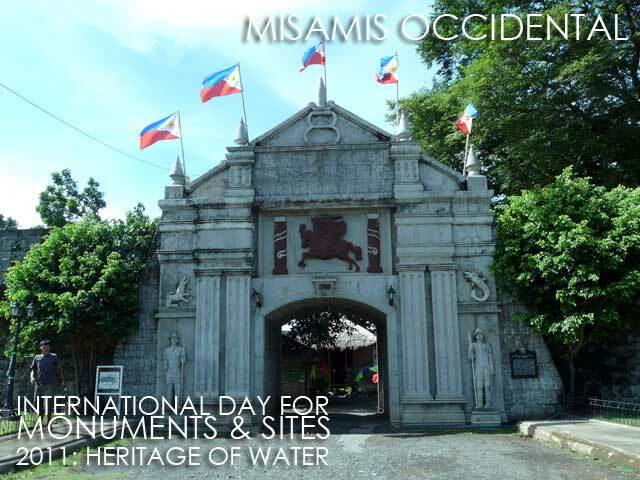 Here are just a few examples of how water has shaped the culture of the Philippines. 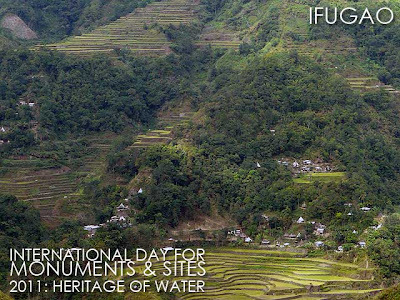 On top of the list are the Rice Terraces of the Philippine Cordilleras, a UNESCO World Heritage Site. 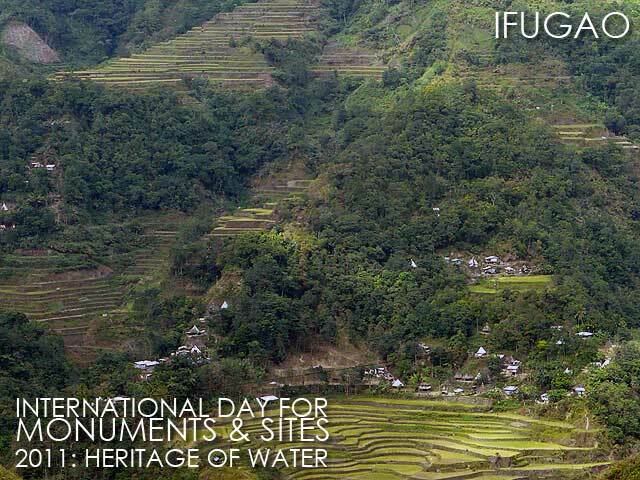 The Ifugao have harnessed water from rain and the mountains for thousands of years to create this unique system of farming rice. UNESCO notes "the development of intricate irrigation systems, harvesting water from the forests of the mountain tops, and an elaborate farming system, reflect a mastery of engineering that is appreciated to the present." Above the terraces are muyong or private forests. More than providing food, wood and medicinal plants to the clans that own them, the muyongs are said to be the source of irrigation water, reduce surface water runoff from rains, prevent soil erosion and thus limit the accumulation dirt in the rice paddies below. Another UNESCO World Heritage Site, the Historic Town of Vigan was a very important trading post long before the arrival of the Spanish colonizers. 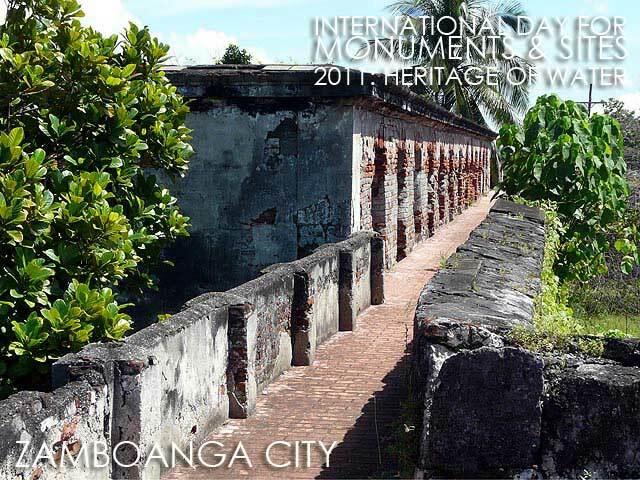 According to UNESCO, "there was a small indigenous settlement on what was at that time an island, consisting of wooden or bamboo houses on stilts." Few people know that Vigan was then an island separated from the mainland by three rivers: Abra River, Mestizo River, and Govantes River. 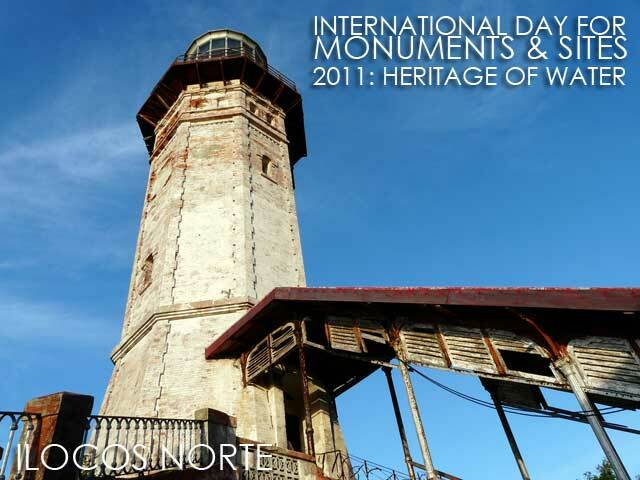 Chinese traders brought goods to the Isla de Vigan from other Asian nations to exchange with local goods. Later in the Spanish colonial period, trade flourished through the rivers. 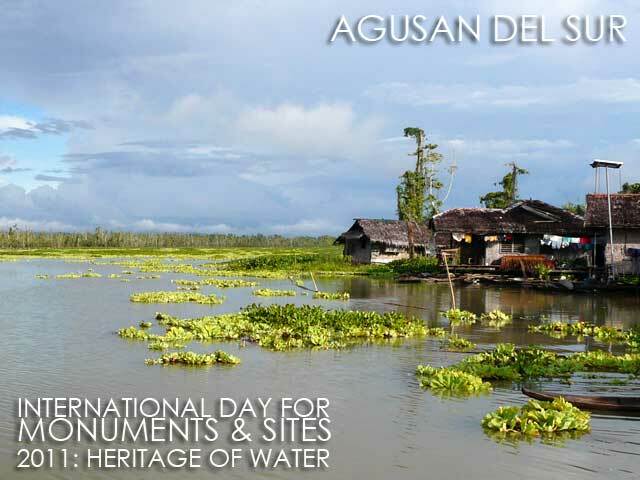 As the UNESCO inscription states, "The Mestizo River was central to the development of the town in the 16th-19th centuries: large sea-going vessels could berth in the delta and small craft communicated with the interior. It is no longer navigable owing to silting, and so the town is no longer an island. As the major commercial centre for the region, Vigan traded directly with China. As a stage in the Manila-Acapulco galleon trade in the Spanish colonial period, it supplied goods for shipping to Mexico, and thence onwards to Europe. This trade resulted in constant exchanges of peoples and cultures between the Ilocanos, Filipinos, Chinese, Spanish, and (in the 20th century) North Americans." 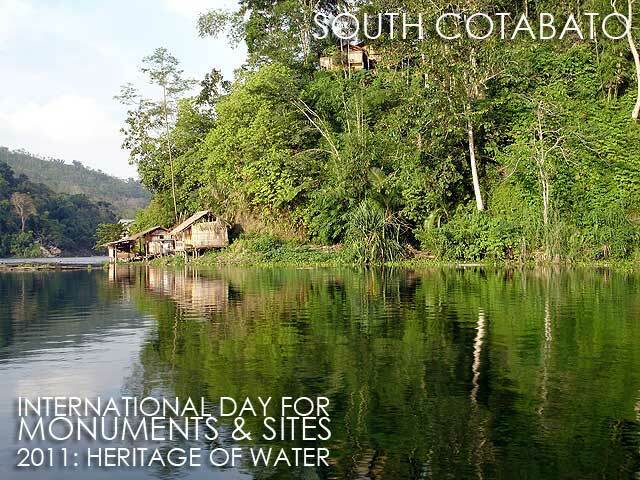 Although part of our natural heritage, the Puerto Princesa Subterranean River and Tubbataha Reef are also inscribed in the UNESCO World Heritage List. 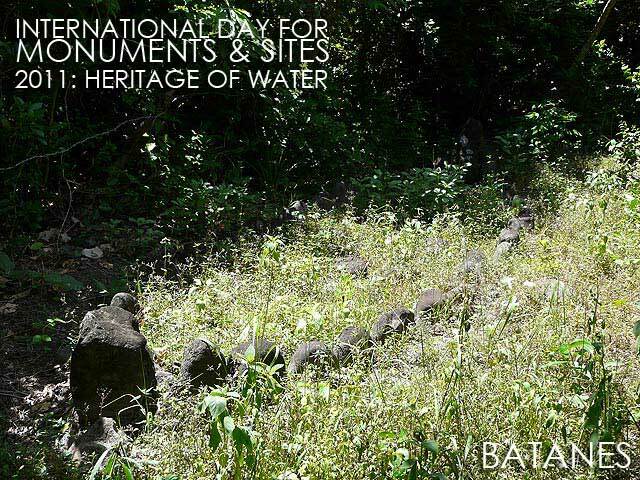 The Philippine Registry of Cultural Property includes several sites related to the cultural heritage of water. 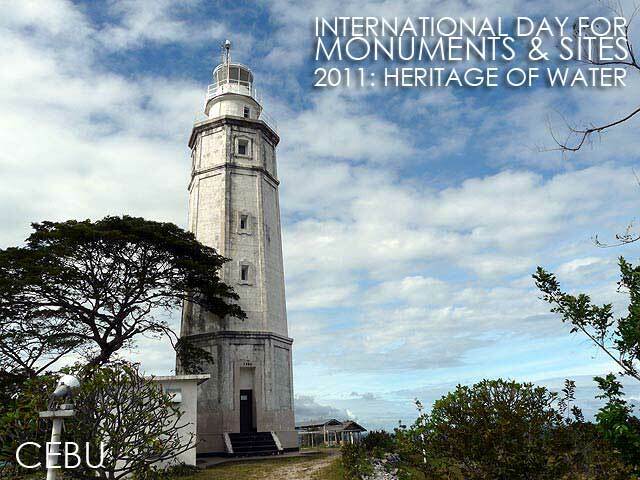 Among our National Cultural Treasures are the Cape Bojeador Lighthouse in Ilocos Norte, Malagonlong Bridge in Quezon, Fort Pilar in Zamboanga City, and the Balangays in the Vicinity of Butuan. 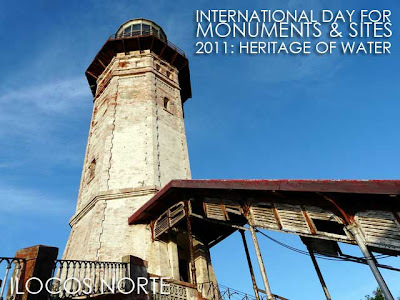 The Stone Bridges of Bohol Province (Lila and Dimiao) and the Cape Engano Lighthouse in Sta. 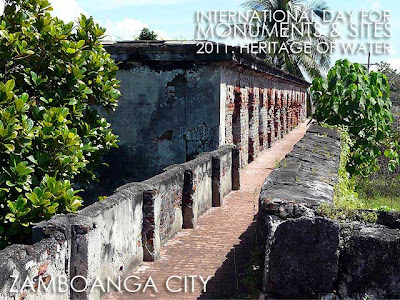 Ana, Cagayan are Important Cultural Properties. 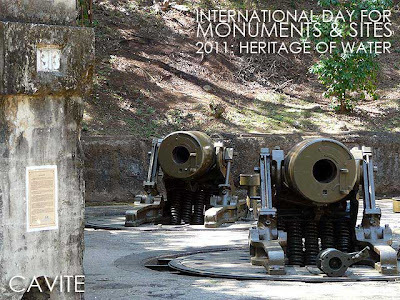 Fort Santiago, Intramuros and its Walls, Corregidor Island and the Site of the Battle of Mactan are National Shrines. 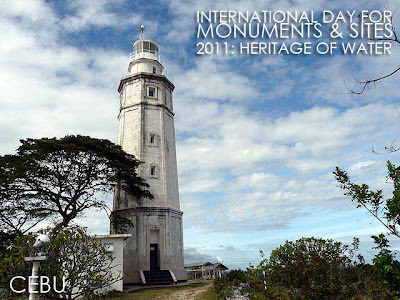 The Punta de Malabrigo Lighthouse in Batangas, Cape Melville Lighthouse in Palawan, Bagacay Point Lighthouse in Cebu, Punta Cruz Watchtower in Bohol, MacArthur Landing Site in Leyte, Fuerte de la Concepcion y del Triunfo Historical Landmark in Ozamiz City and several fortress churches are National Historical Landmarks. 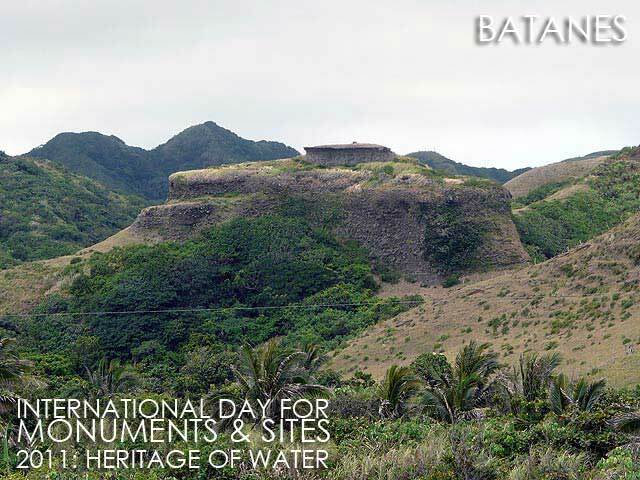 In Batanes are prehistoric fortresses such as the Savidug Ijiang, boat-shaped graves in the Nakamaya Burial Grounds and the Kapayvanuvanua rituals of the Diura Fishing Village. At the Nakamaya site, a wooden sign board explains the significance of the place: "The stone boat-shaped burial grounds shaped in the traditional wooden boat of Batanes called tataya are testimonies to the values of the prehistoric Ivatans who believed in life after death. 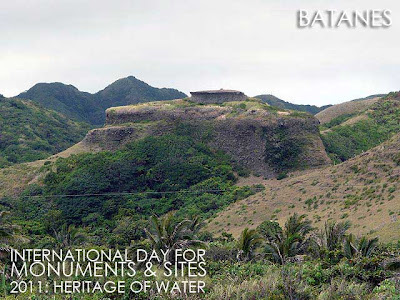 The general direction of the boat-shaped burial grounds face the sea which, according to an old Ivatan folktale, is the final resting place of man." Diura is a tiny village of Mahatao facing the Pacific Ocean. The village is most known as a fishing area for mahi-mahi or dolphin fish which is called dorado in Batanes. To signify the start of the fishing season, the fishermen perform the Kapayvanuvanua ritual. 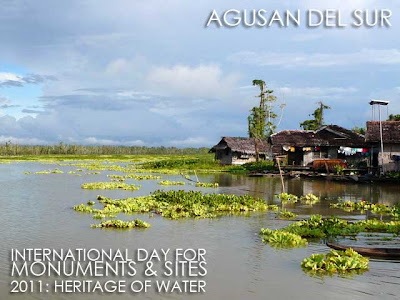 The daily lives of the Manobos of Agusan Marsh and the T'bolis of Lake Sebu revolve around the water environment they have have lived in for generations. Water has also been a very important element of our local festivals. 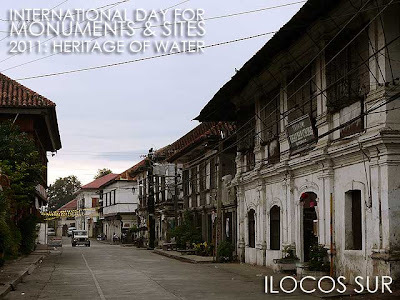 Every June 24, towns and cities around the country celebrate the feast of San Juan Bautista with water in the streets and a lot of merrymaking. Same is true for the Higantes Festival and feast of San Clemente in Angono where you're sure to get wet. 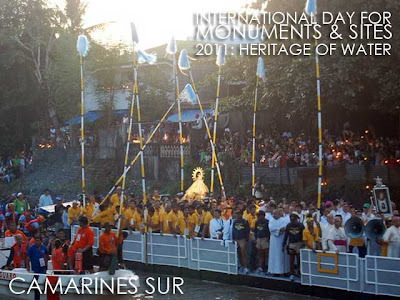 A fluvial procession around Laguna de Bay follows the wet and rowdy procession around town. Another water festival is the Apo Iro Fluvial Procession in Apalit, Pampanga from June 28 to 30. 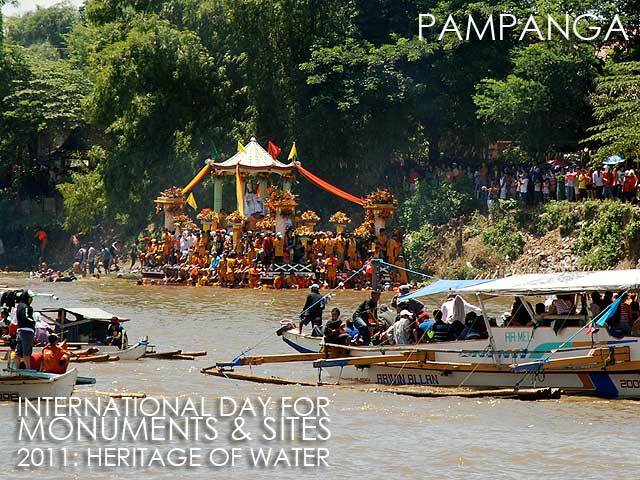 Other famous fluvial festivals include the Pagoda sa Wawa in Bocaue, Bulacan and the Penafrancia Festival in Naga, Camarines Sur. What is the cultural heritage of water in your province? 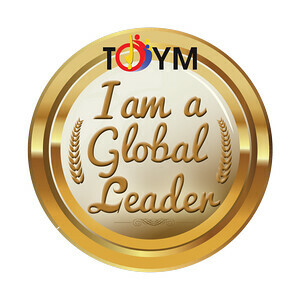 Share them by commenting below. 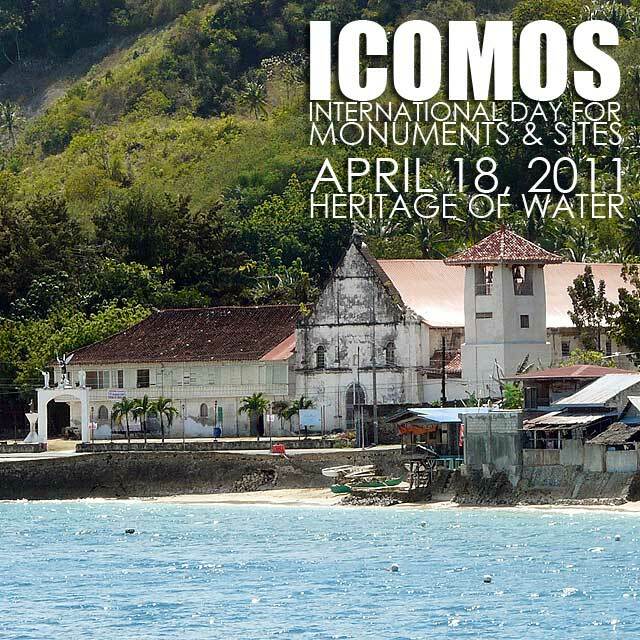 Ivan Anthony Henares is a member of the ICOMOS Philippines National Committee and expert member of the International Cultural Tourism Committee (ICTC).